Hortus Camdenensis | Abelmoschus manihot (L.) Medik. Frost-tender, evergreen shrub with an erect stem, large 7-lobed leaves and large, white or sulphur-yellow flowers, to 15cm across, with a large maroon blotch at the base, either singly or in few-flowered racemes. To 2m. [RHSD, Hortus]. ‘This beautiful flower is a native of China and Japan, and has at times been cultivated in this country since the year 1712, at which period it was sent to the Royal Society as one of the fifty specimens annually delivered from the Apothecaries Garden at Chelsea. The genus Hibiscus contains many plants so differently organized, that they might be advantageously divided into several genera.’ [BM t.1702/1815]. A second variety [beta] was figured in 1832: ‘The present is distinguished by the greater size and beauty of the flowers, and the less deeply divided leaves.’ [BM t.3152/1832]. ‘In Japan they use the mucilage of the root to give a consistency to paper as Thunberg informs us.’ [Don]. Listed in the 1850 and 1857 catalogues [T.543/1850]. 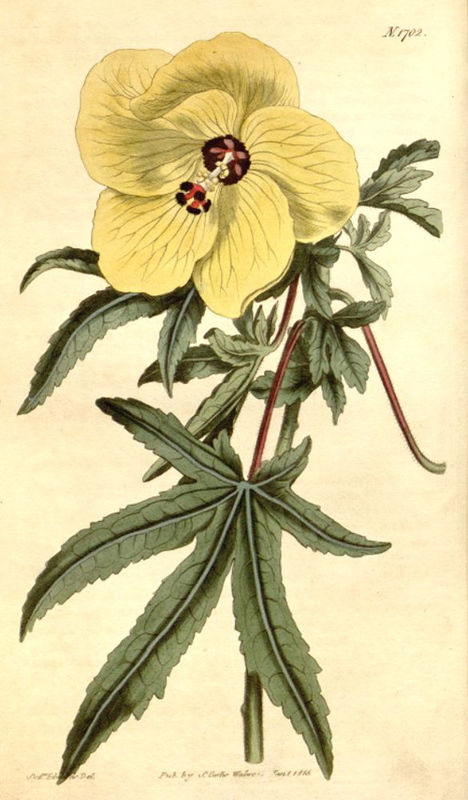 Seed of Hibiscus manihot was ordered from Warner & Warner, Seedsmen and Florists, Cornhill, on 12th April 1846. [MP A2933-1, p.131].